I was thinking about this while working at a El Paso refugee center, and as the immigrants, the large majority indigenous Guatemalan rural workers and farmers, passed through. These workers too are coming north to escape crushing economic, and, also, social horrors. Sometimes the analogy to the braceros seems direct, as when those I met were headed to Salinas to work in the celery fields or Florida to work in tomatoes. But this modern day bracero-like flow, has as many women (and children) as men. They are headed to every point on the U.S. map — indicative of the fact that cheap labor from countries to the south is now an essential part of a broad swath of the U.S. economic system nationally, from the fields to office buildings, construction to restaurant and hotel workers, elder and childcare, and so on. As the original bracero was under “contract” and constant scrutiny, and subject to deportation for any sign of errant behavior, ie protesting unjust conditions, these new refugees, who come seeking asylum, are fitted with ankle monitors and will be kept under the constant eye of authorities. As was the bracero in the past, these present day immigrants are regarded and treated as less than human. On the way to take a mother and two teenage sons to the bus station for a trip to the city where their sponsor awaited them, I asked one of the youths how things were in ICE custody. “Malo”, he said. For several days a large group of refugees he was part of, waited under a bridge just inside the U.S. border for CBP/ICE (Customs and Border Patrol/Immigration and Customs Enforcement) to show up. When they did, the agents got out of their trucks and began yelling, “levantate perros!” — get up dogs! before loading the refugees on to buses. The boy was quiet for a while. “No somos animales”, he said in a low voice. At the refugee center I was a accompanying a man with his teenage son to his room when he stopped to tell me a story of his ICE detention. He went on to describe the brutality he saw there. One of the detainees he was with was an indigenous farmer who spoke little Spanish. A guard yelled at this man to take off his hat, using a Mexican slang term in Spanish not used in Guatemala. Not understanding the command, the refugee just smiled at the guard, at which point the guard grabbed him and threw him to the ground, which was covered with gravel. While the guard forced him on his stomach and handcuffed him, the refugee’s son stood near crying in terror for his father. In another account a group of refugees were sitting on the ground when ICE people brought some sandwiches. ICE sandwiches are notoriously bad — ham and cheese, usually served frozen. When the refugees showed no inclination to get up to get these sandwiches some guards came over and started kicking them. I heard various accounts from refugees – of men, women and children, including very young children – being kept outside in the cold for 12 to 15 hours unprotected from the biting wind with no effort whatsoever to relieve their suffering. Another described being terrorized by the sight of large quantities of blood on the floor and walls in an area they were brought to register. Refugees’ possessions, including extra clothing, cellphones, bags, suitcases, even shoe laces were routinely taken from them and thrown away. Most refugees arriving at the shelters had nothing but the clothes on their back, without even toothbrushes or combs. Refugees arrived at the center without needed medications for ailments like asthma, because these too were taken by ICE and discarded. 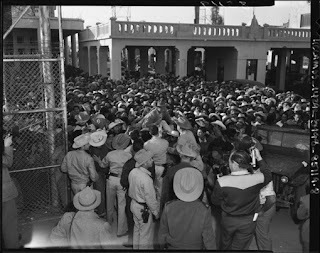 In the 1950s song Deportee, Woody Guthrie describes the bracero, once the harvest is over, being chased out of the country “like rustlers, like outlaws, like thieves”. The description seems naïve and innocent compared to the way those coming north now are regarded. Today they are denigrated as “criminals”, “rapists” and “gang members”. They are denounced as “invaders”. Trump and his ilk make no secret of their racist contempt and violent provocations. In the case of braceros, at least it was acknowledged that they were coming to the country to do necessary work. In this Trumpian age of hyper hypocrisy and pathological dishonesty, even this modest recognition is denied refugees – and us. Abuses against immigrants are, as we are seeing, a part of a broader panorama of white supremacist assaults, including murderous assaults, on non-white people. This is a fascist mentality at work. The militarized border system and vast network of detention camps built up especially over the past 25 years, by both Democratic and Republican administrations, is now at the service of a fascist government, which, among other things, has dramatically expanded the detention of children and teenagers. The system is not only brutal and repressive, it is a training ground for instilling a mentality that regards immigrants as less than human and justifies treating them that way. According to a recent Supreme Court ruling immigrants who have been convicted of a crime any time in their past, can be held in these immigrant prisons indefinitely! At the border and across the country there are many, many people engaged in work to help, protect and defend immigrants. There are churches, secular groups, immigrant rights groups, lawyers and lawyer groups, other political groups and individuals who are engaged in accompaniment, advocating for those detained, promoting sanctuary, and in other efforts to defend immigrants from a system that both uses and criminalizes them. All this is important. All this needs to continue and intensify. But it is clearly not enough. The level of abuse, the intensity of the racial hatred being directed against immigrants (and others outside the narrow frame of white supremacy), is such that we are in ugly, dangerous territory. There is an urgent need to repudiate and denounce these policies and actions — not only in meetings and private spaces, but in the streets, in public and in a massive and determined way. For the sake of our own humanity, for the sake of our collective moral well being and for the future of this society and world, there needs to be a massive and sustained mobilization to make clear to all who care to pay heed that we will not tolerate, we will not abide by the racist abuse being visited on our immigrant and refugee populations, people of color in general, Muslims, Jews, etc. In other words, this whole white supremacist onslaught needs to be confronted in a way it has not been confronted before.